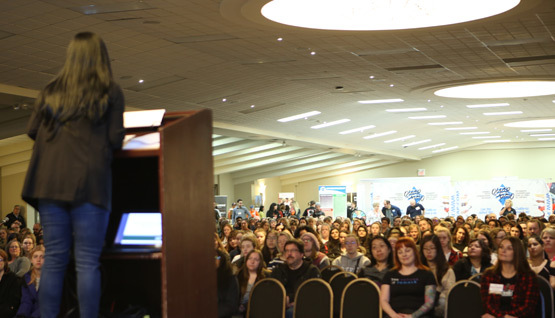 On April 2, 2019, Build a Dream transformed Bingemans Conference Centre into a career pathway exhibition. Kitchener-Waterloo is the third region in the province to invite the organization to the area as school boards learn of the success other cities have had connecting young women and their parents to careers that they may not have previously considered. The tri city area sold out vendor space and attendee tickets long before the registration deadline. “We were so pleased with the response but really, I should have known that this would happen. The region is booming and already has a strong manufacturing and tech/research sector so we know that there are great jobs here. We want students to know that there are exciting opportunities for them and it’s more than just giving information; the exhibitors here today made it tangible…they give credibility to the stories that we are sharing,” says Nour Hachem-Fawaz, president and founder of Build a Dream. One of the highlights of Build a Dream is having a keynote speaker who works in an underrepresented career. Jamie McMillan took the stage and interacted with the audience, asking and answering questions, and providing an honest account of where her life and career took her. A journeyman ironworker, boilermaker, and owner of Kickass Careers, Jamie speaks to students on a regular basis and shared that knowing about other career options like skilled trades would have changed her life at a much younger age. Jamie’s enthusiasm for her career is evident and after her talk she spent time with students at the Kickass Careers photo booth, explaining equipment used as props, and joining in on the fun. “Apprenticeship was an incredible opportunity in my life,” said panelist Elizabeth Moses, a CNC machinist. Many people told her to quit and suggested it wasn’t a field for her. Faced with similar negativity, Bruna Grochot, a Civil Engineer and Project Coordinator at EllisDon said that she did not give up and found new ways to approach challenges. She also benefited from finding an employer who encourages diversity. Brandi Ferenc, a Chiller Mechanic at Johnson Controls discussed the benefits of her career, including the pay. As one of only 3 women in a union of 3,000, Ferenc has heard a few quips because of her gender but with her Refrigeration License (313a red seal) and Gas Fitter 1 ticket, she knows that her schooling and qualifications are just as valuable as any member of her team. Following the talks, attendees were able to try hands-on activities and speak with professionals from a variety of careers that they may not have previously considered. Many companies also brought female mentors to the expo so that parents girls could actually see a woman in these roles, and so families could ask questions about career options. So after a full night what do Kitchener-Waterloo families say about the Build a Dream career expo? Organized by Build a Dream — but not possible without the support of amazing partners, fantastic sponsors, and a load of wonderful volunteers — the first Kitchener-Waterloo Build a Dream expo was certainly a success with 900 registrants and 40 exhibitors. In November 2019, Build a Dream will be in Windsor and London, Ontario, with plans to host expos in 5 cities in 2020.